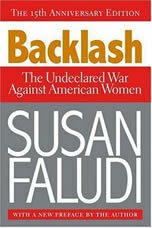 Backlash Research Papers examine a book by Susan Faludi discussing feminist progress in the last decade and how it is being undermined. In the last decade a progressive counterassault has been underway to abjure the hard won successes women have made thus far. There is a big lie that feminist progress has only led the way for its own downfall. The "backlash" has increased anxiety women experience in trying to push forward which in turn leads to the breaking of their will. The backlash that has taken hold of the feminist movement has undermined its value to the American people as nothing more than a source of compromising problems socially, economically, and personally. It can even go as far as giving rise to pressure on legislation to reverse much of what belongs to the women’s rights movement. Faludi points to several myths that have floated around America in with the prospect of convincing women that their independent progression was only making things worse for themselves. Evidence to prove otherwise is well documented and as Faludi points out often hid from the general public. For instance, the myth that the longer career women wait to be married the fewer prospects are available. Simply not true but many newspapers and other media forms carried the news of such a statement. When someone stepped forward to refute such claims their studies fell on deaf ears. Likewise is the myth advocated by Lenore Weitzman that divorced women under the new no fault laws experience a 73% decrease is their living standard. Not so according to Saul Hoffman and Greg Duncan. Their study revealed much lower numbers and even found that after five years, divorced women had a slightly higher standard of living than when they were married. Weitzman denied access to any of her data but Duncan and Hoffman’s data was backed up with similar findings by the U.S. Census Bureau. What do these changes to the backlash myths indicate? They point once again to the propaganda that sells the information that women’s equality is more harmful than good. It should not surprise us however, since the backlash phenomenon has presented itself throughout America’s history. In fact the women’s rights movement is the only progressional movement that at times has reversed. A time line of women’s rights shows nothing but leaps and halts and drops in its forward progression. Faludi asserts this line of progression as, “The American woman is trapped on this asymptotic spiral, turning endlessly through the generations, drawing ever nearer to her destination without ever arriving." Civil Rights Act of 1964 research paper shows that the act did not bring about instantaneous change, but it did draw a line in the sand. Women and Female Saints Research Papers as an advocate for the women's suffrage movement, which sought to give women legal equality with men that would allow them to vote and live independently. The Subjection of Women Research Papers explore the notion that the case for ending the subjection of women is daunting and yet his contemporary circumstances made it propitious for their emancipation. Women's Suffrage Research Papers - The rights of women around the globe have never been assumed as equal to those of men. Feminist Thought Research Papers discuss the dramatic changes of feminism since it first came about. Women's Activism Research Papers - Women's rights have been an issue of debate and sought after by feminists for years. Much progress has been made over time. Paper Masters writes custom research papers on Backlash and examine a book by Susan Faludi discussing feminist progress in the last decade and how it is being undermined.